Congratulations to Chloe Marshall, who is the first finalist for the title of Miss England who is plus-sized. She is excited to show that it’s possible to be beautiful without being stick thin. “I wanted to go through to the Miss England finals to break through the stereotype that you have to be tall and skinny. “I wanted to make a bit of a statement. When I studied the other entrants for the Miss Surrey competition I concluded that pretty as the contestants were, they were equally all uniformly blonde and Barbie doll like. I want to give her a big shout-out! She IS beautiful and size 16. Thanks for showing the world that the two are not mutually exclusive. Weight loss drugs have been shown to have link to depression and suicide. 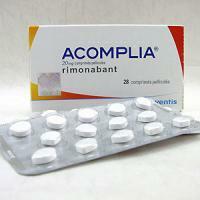 The diet drug rimonabant (Acomplia) perfectly illustrates this discouraging trend. It truly seemed to be a miracle drug in early trials, effectively combating patients’ dependence on tobacco, decreasing appetites and promoting weight loss in obese individuals, and even counteracting addictions to alcohol and cocaine. Originally marketed primarily as a weight-loss drug and only tepidly endorsed as such by the FDA in 2006, it was denied approval as a smoking cessation aide. It was never actually formally approved for either purpose, and in the face of this new data the likelihood of its availability to the American public looks slim at best. By suppressing the same cannabinoid receptors that create the highs and hunger pangs associated with marijuana use, the drug may effectively shut down the pleasure mechanisms in certain individuals’ brains, and this reaction triggers an adverse response amounting to deep depression and, in extreme cases, suicidal thoughts. Next time you’re tempted to spend your good money on weight loss drugs, remember that there is a lot more at risk than just losing money. You can lose weight on your own without the use of questionable medication. Marilu Henner is promoting her new book, Wear Your Life Well. She promotes a macrobiotic and vegan diet, but this book also covers all the Inner Workouts that you can do to fix your mind. 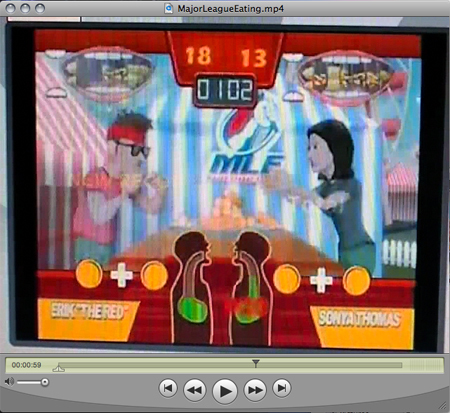 In this video game, you use your Wii controller to pretend to overeat more than your competitor. You can pretend to be one of the “famous” overeaters like Sonya Thomas or Patrick Bertoletti. Really? Do we really need a video game for bingeing? I’m shocked that it’s considered a sport. I have no idea why it is shown on ESPN, but now it also has a video game?! Can anyone explain this to me? For the first time, a woman has won The Biggest Loser! 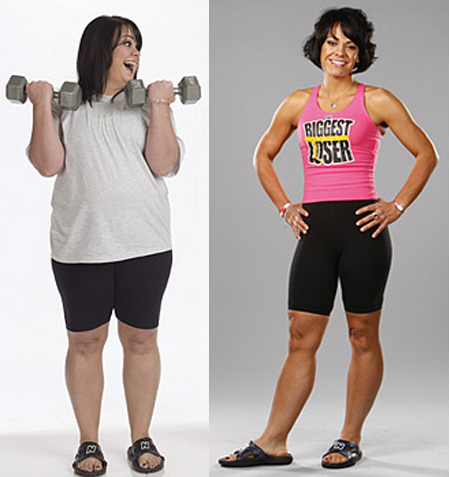 Ali Vincent won The Biggest Loser, even after being sent home in week four. Here is a video interviewing her and Jillian, her trainer on the show. She’s sending a message to women out there that when you connect your mind, your body and your intention, anything is possible. Since women typically don’t lose weight as quickly as men, it has been thought that a woman couldn’t win The Biggest Loser. Every season, women have said that they were going to be the first woman to win, but this time, Ali did it! I love this article from McSweeney’s Internet Tendency. McSweeney’s Internet Tendency: Cookie Monster Searches Deep Within Himself and Asks: Is Me Really Monster? 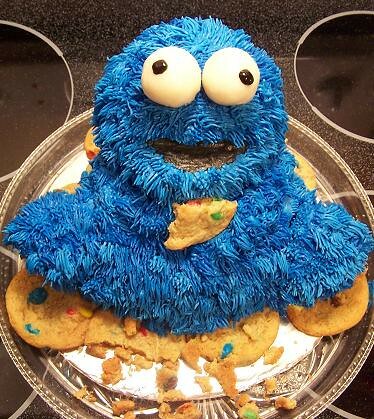 Cookie Monster wants to know why he is called a monster, whereas the other monsters on Sesame Street have names like Elmo and Telly. Is he actually a monster? This paragraph is so familiar to me that it reminds me of how I have been a monster. When me get back to apartment, after cookie binge, me can’t stand looking in mirrorâ€”fur matted with chocolate-chip smears and infested with crumbs. Me try but me never able to wash all of them out. Me don’t think me is monster. Me just furry blue person who love cookies too much. Me no ask for it. Me just born that way. It has been months since I’ve had a binge and I’m beginning to feel that it was physiological, not psychological. It was in my body, not my head. I haven’t changed my mind at all, but I have been free from that constant desire to binge for two months now. I quit cold turkey. I stopped eating carbs, sugars, artificial sweeteners and anything with caffeine. Just protein and green veggies for me and I have been free from that desire to binge for two months. It is such a blessing that I can’t express how liberating it feels. Cookie Monster, you’re not a monster. The cookies are. Via: Mind Hacks: Is me really a monster? 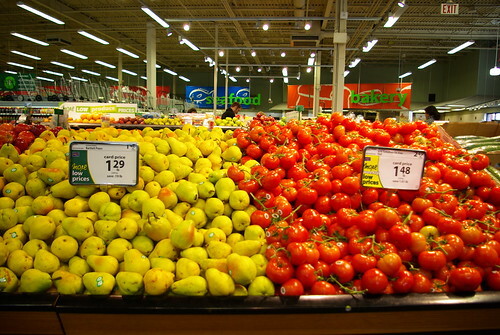 This article from MSN shows how grocery stores set up their floor plan to increase sales. Unfortunately, sometimes that means food that we didn’t want ends up in our shopping carts. We’ve all heard the adage to never go grocery shopping hungry. Here are some other things you might want to know. The shopping carts have cooties. Food expiration dates are open to interpretation. Kid-friendly food is purposely placed within their reach. They cut up food so they can charge more. Good-for-you foods require bending and reaching. End-of-aisle displays are there to distract you from your mission. Bargains arenâ€™t always a bargain. Youâ€™ll walk the store the way they want you to. The salad bar can make you sick. They donâ€™t always clean as often as they should. I have heard that the best way to shop at a grocery store is to only go around the edges. The fresh food like veggies, fruits, dairy and meat needs refrigeration and ends up along the edges and in the back of the store. Avoiding the inner aisles helps keep tempting (and “kid-friendly”) food out of your cart. My BEST weapon to protect me from buying food that I shouldn’t be eating has been my camera. If I see something that I like and think I want to buy (despite the cost or sugar content), I snap a picture of it instead. Then, if I REALLY want it later, I can go back and buy it without worrying that I’ll forget. EVERY time, so far, I have looked at the picture and wondered what I was thinking. It is no secret that the American culture is known for overindulgence. This public service campaign dramatizes the effects of poor eating in a way we can all understand. Public service campaign? Read the fine print on the ads and tell me if it’s a “public service” or not. But it doesn’t have to end this way. Find out how bariatric surgery can help. The Northern Bariatric Surgery Institute. www.cutweight.org. That little URL leads directly to the website for William S. Peters, M.D. That is NOT a “public service” announcement. It’s a barefaced advertisement for a surgeon using scare tactics. I’m not here to argue whether obesity kills because even the medical community is split on that issue, but we KNOW that bariatric surgery kills 1 out of 200 patients. The most commonly cited mortality rate for bariatric surgical operations, across the United States, is 0.5%. That looks pretty good, till you do the math and realize that means about 1 out of 200 patients will experience a fatal result. Don’t let them lie to you. Promoting the idea that it’s better to be dead than fat isn’t a public service. It has been brought to my attention that there are posters circulating on the internet that are being associated with me. I would like it to be known that I am in no way associated with this marketing campaign and I have taken formal action to have my name and likeness removed from any such product, poster, internet site or publication. Just for clarification, I have never been associated with this organization and am disgusted by their vulgar display of obesity. This is something I would never stand for and am appalled that anyone would even consider placing material of this nature out for public viewing. These ads were created on a sample basis for a support group that Dr. Peters meets with. His position is and has always been that he sees the ads as disgusting. I am emailing you because the ads are damaging his business and they were proliferated throughout the internet by my own selfish motives without his knowledge. I apologize for the level of insincerity the ads depict and would be grateful if you could remove the post. If not, please let me supply you with new images that do not connect Dr. Peters to the graphic nature of the content. My first thought was of all the years I suffered with digestive troubles. It had nothing to do with age and everything to do with a bad infection. When I took the antibiotics to kill the infection, it killed all the good stuff in my body as well, so I had stomach trouble for over five years. I haven’t had stomach troubles at all for over three months, which is when I stopped eating carbohydrates. Can a low-carb diet cure Irritable Bowel Syndrome? Well, it’s the COMPLETE opposite of the diet that the stupid gastroenterologist recommended. Of course, when I ate his diet, I suffered MORE. I haven’t taken fiber supplements or acidophilus for two months and I haven’t had one incident like the skit above. I don’t think I’ll be needing any Activia any time soon. I love my body and think it’s perfect, but I pretend not to because that’s what normal girls do. If you say something enough times, you begin to believe it. Keep your perfect body and throw the false modesty out the window.